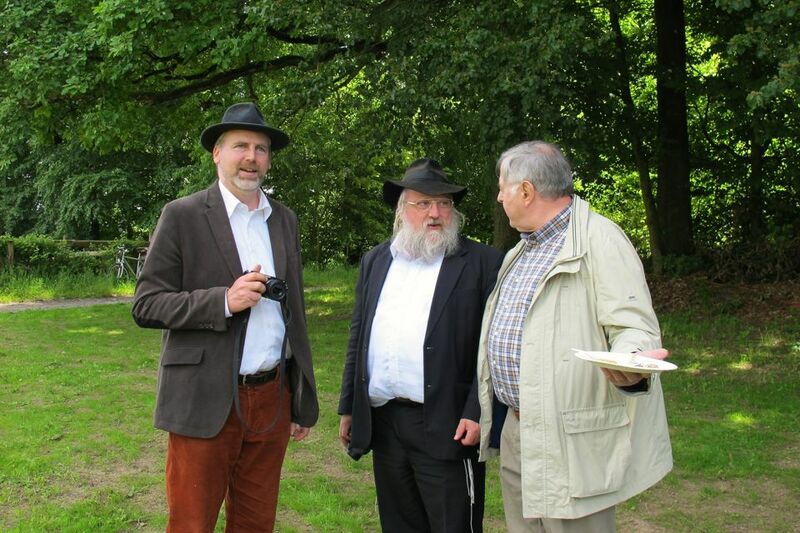 A fest of encounters with the Jewish-Chasidic congregation of Karlsruhe took place on May 18th, 2014 at 12 a.m. 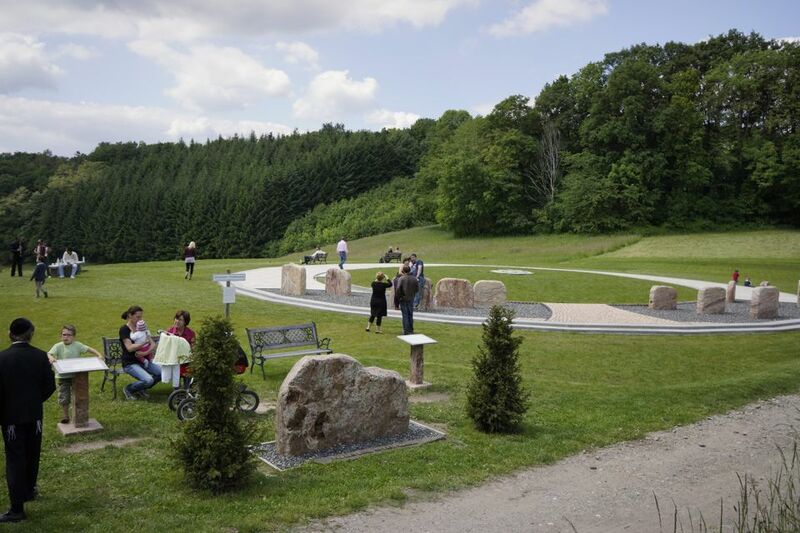 The Jerusalem Friedensmal with its atmosphere and symbolism opens the space for togetherness. 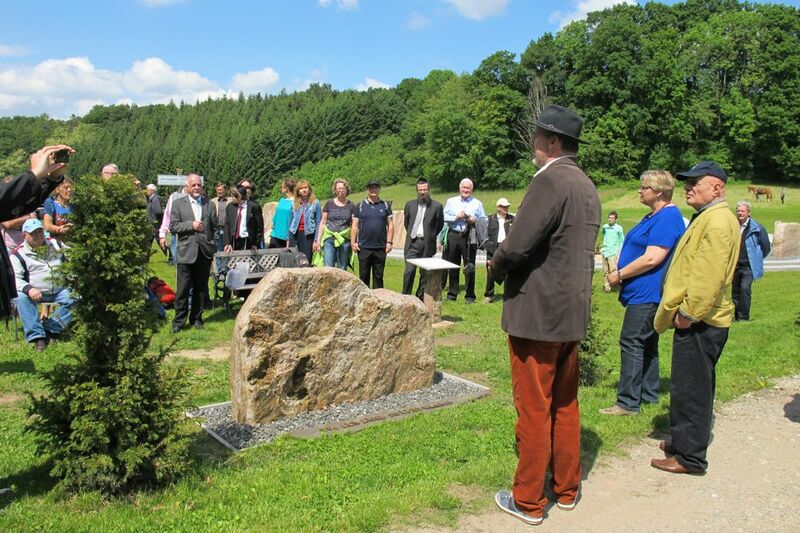 It demonstrates the life lessons that our modern German society can learn from a dark past: The project is dedicated to the dignity and freedom of people, and Germany’s recognition of a Jewish root (through Christianity) in our European culture. 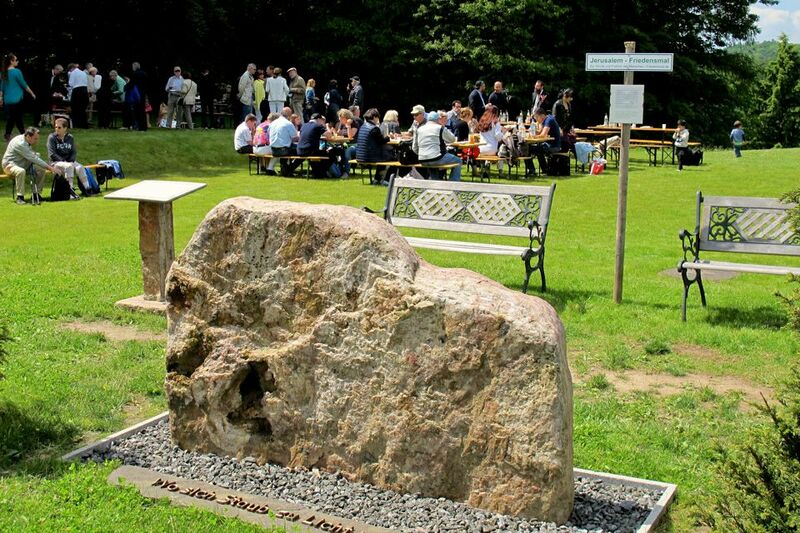 The fest commences at the Border Stone. It features a side of suffering, with the inscription “Where dust is turned to light”, as well as a side of freedom and hope as a call for the new life of „Heavenly Jerusalem“: Yerushalayim. 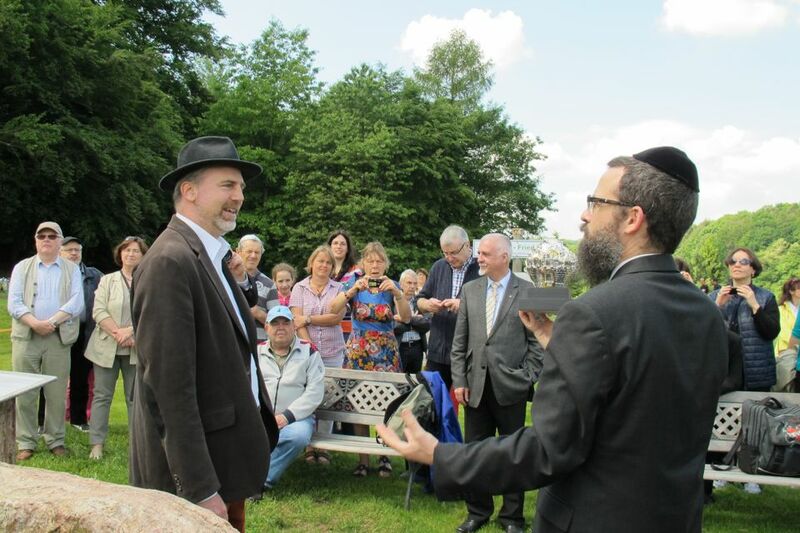 Rabbi Mordechai Mendelson hands over at the Border Stone a Jerusalem sculpture made of silver to the initiator of the project of the Jerusalem Friedensmal. 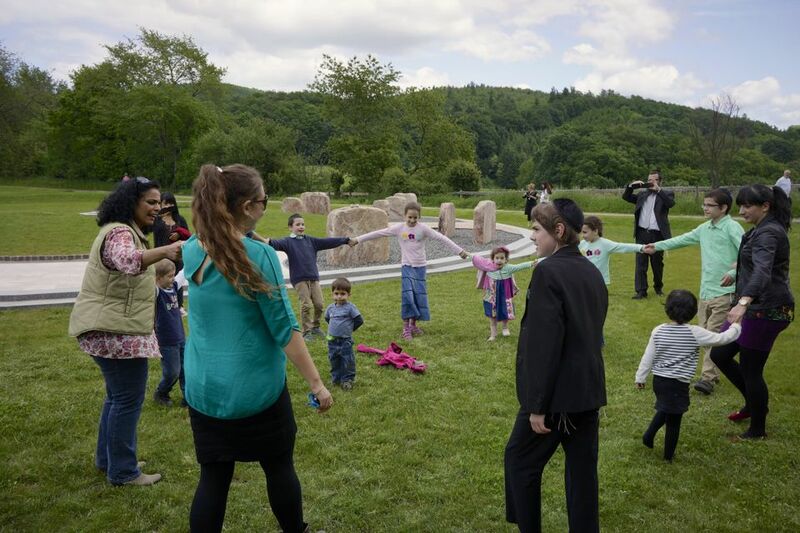 Jewish children play at the Jerusalem Friedensmal in Bensheim-Hochstädten. 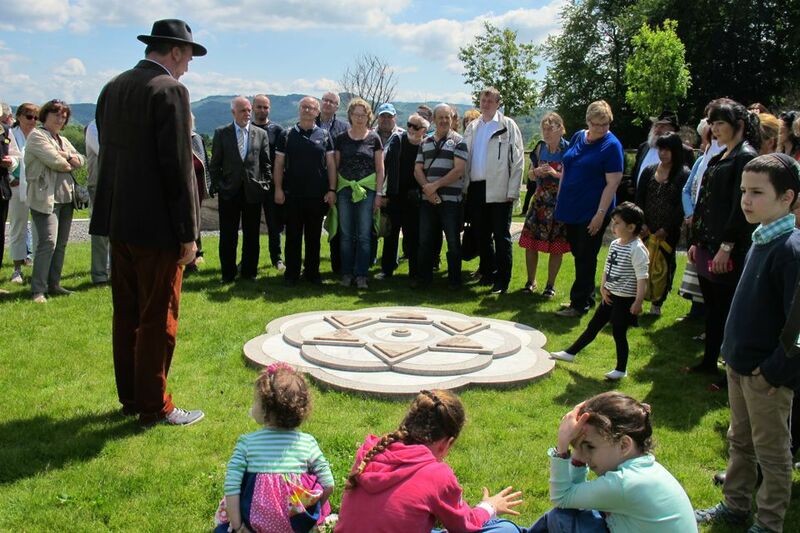 The mayoral candidates of Bensheim at the Circle of Peace. 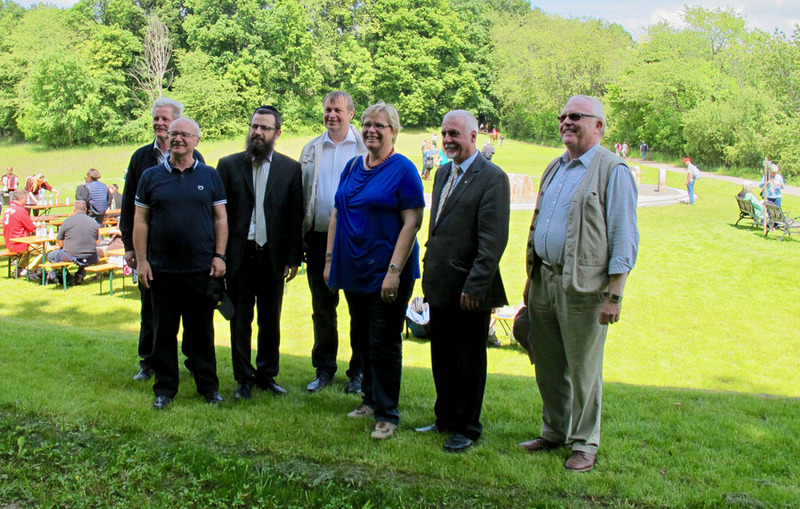 From left to right: Bernd Rettig (mayor of Bensheim-Hochstädten), Franz Apfel (BfB), Rabbi Mordechai Mendelson, Rolf Richter (CDU), Sylvia Kloetzel (SPD), Jürgen Kaltwasser (mayor of Lautertal), Roland von Hunnius ( FDP, county Mountain Road). The path that leads into the Tree of Life (in the Circle of Peace) over the Threshold of Humility: “Recognize the Holy in your midst”. Does the “White Rose” feature a Star of David or a Christmas Star? 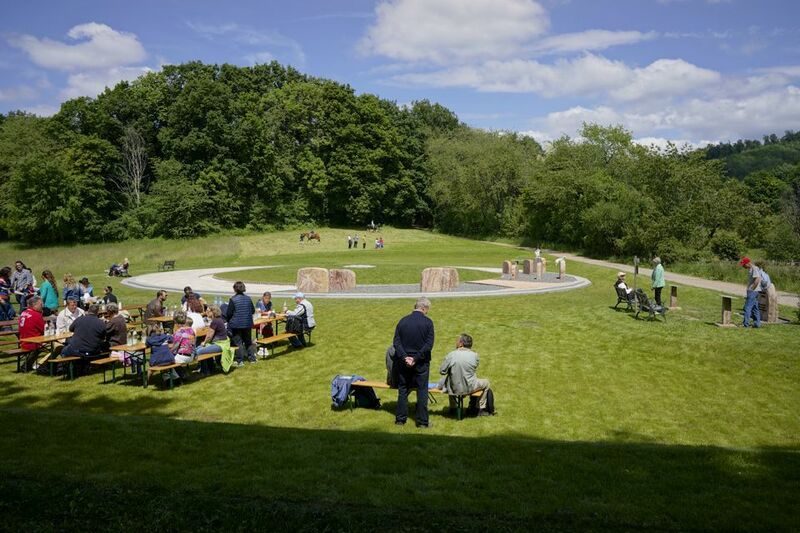 The Rose of Shalom at the heart of the Circle of Peace. Jews and non-Jews alike are eager to discover more about the underlying symbolism. 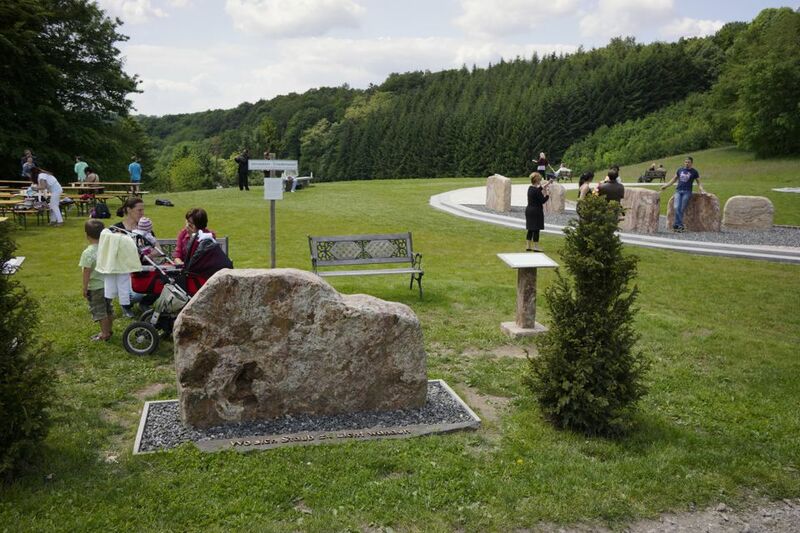 The Border Stone with the sign to “Where dust is turned to light” (Nelly Sachs) and “Yerushalayim”, a call of hope, also recognizing a Jewish root of our European culture. Lessons on Jewish jokes (absolutely recommended for non-Jews). 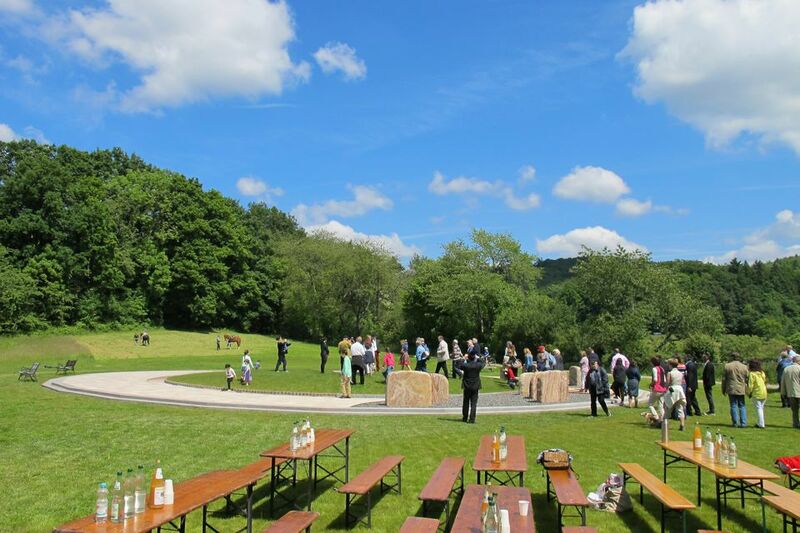 Where dust is turned to light – a kosher picnic with the Jewish congregation. 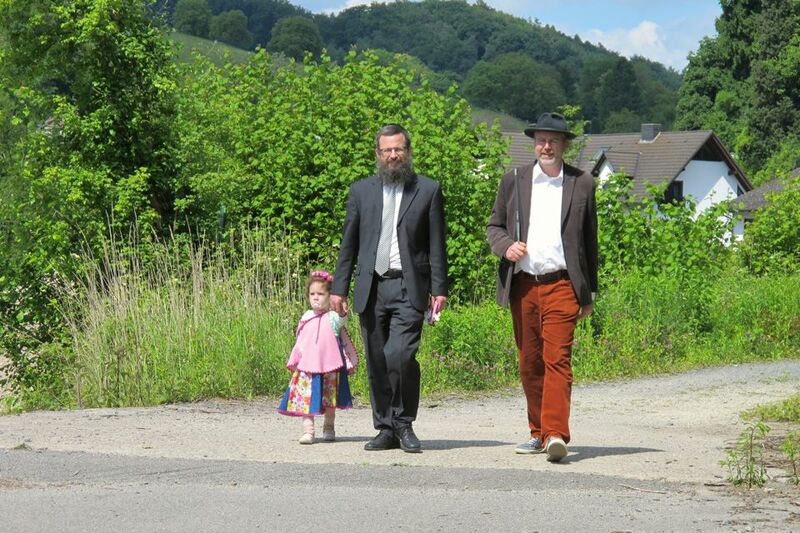 The moment of goodbye – the congregation continues their journey to Michelstadt. 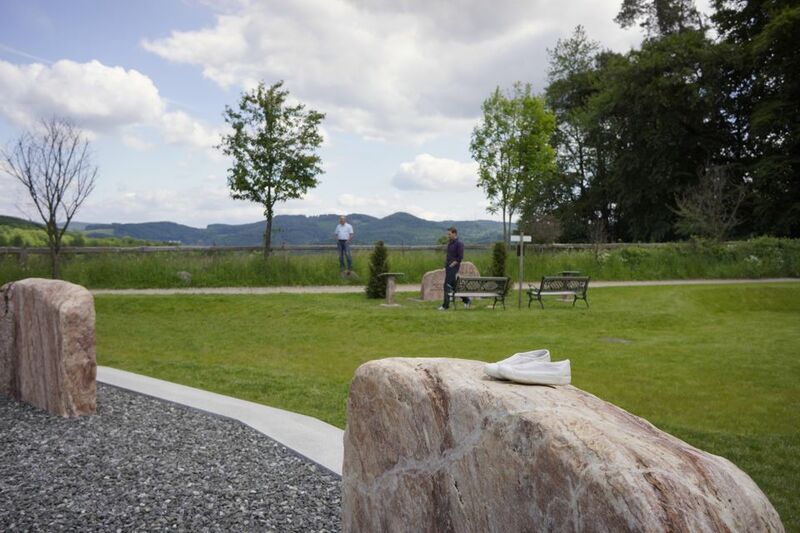 Quiet has returned to the Peace and Freedom Site by the European long-distance hiking trail. 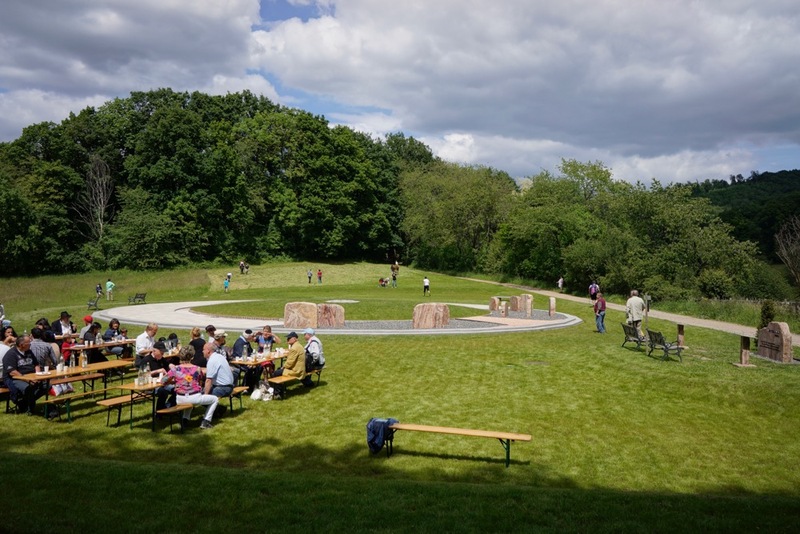 However, the lively bustle soon returns, as many groups of hikers who are enjoying the weather visit the site later in the day.